In 1911, a man known as “Ishi” (the name just means man in his language), believed to be the last of the Yahi people, emerged from the wilderness after 44 years. He was taken from Oroville, California to San Francisco by an anthropologist, to work with a group that wanted to learn more about Ishi’s language and culture. When the train came into the station to take him to San Francisco, Ishi went to stand quietly behind a pillar. Puzzled, the researchers beckoned to him, and Ishi joined them and got on the train. They asked him about it later, and he said his people had seen the smoky, noisy train snaking through the valley for many years, with faces visible through the windows. The Yahi had always believed it was a demon that ate people. The researchers asked, if that is what he believed, how could he have possibly gathered the courage to get on board? I first read that story in Pema Chödrön’s book Start Where You Are: A Guide to Compassionate Living. Ishi’s story is sad and complex, but he struck the people who knew him at the end of his life as being markedly calm, measured, and kind. His words have never left me — they strike me as being a true motto for a life worth living. I genuinely thought it was a funny question. I told her that I don’t think of myself as particularly courageous at all. In fact, I’d say I’m scared most of the time. But if Ishi, who had survived so much that he outlived all of his people, could be more curious than afraid, I’ve never thought I had much of an excuse for holding back just because something scared me. There will be trolls, creeps, delusional people, and the occasional idiot. People will question your motives, your competence, your scruples, your beliefs, your body fat composition, and what you’re wearing. I’m not going to tell you that it doesn’t matter, because that probably won’t help. If you could shrug these things off so easily, you probably wouldn’t have clicked through to read this article. But I will tell you that courage is a habit, and you can get better at it. Allow me, a lifelong coward, to share some of the techniques I’ve learned for being more curious than afraid. I’ll start with a resource I discovered not too long ago. If you haven’t picked up Kelly McGonigal’s book The Upside of Stress yet, I found it fantastically useful. It pulls together a lot of research to support a single point: Despite what we believe, stress is not always harmful. How we think about our stress affects how our bodies react to it. For example, when people perceive stress as a sign that they’re doing something that matters — something hard but rewarding — their stress-related health risks drop dramatically. But “embrace your stress” only goes so far. You’ll also want to take some practical measures to neutralize it. One concrete thing you can do is reduce the number of things you need to worry about. If you’re going to claim a public voice, it just makes sense to be smart about keeping yourself secure. There are sensible actions everyone can take to keep our sanity and protect our privacy. Before you explore the technical solutions, start by making a commitment to be intentional about how much personal information you share. Decide how many details you want to share about your family. You can draw this line wherever you feel is best for you — there are plenty of folks with successful online businesses who share pictures of their kids. Just be conscious about it, and be consistent. Protect your website. Use hosting, themes, and plugins that have a good security reputation. Subscribe to a monitoring service like Sucuri to make sure bad guys aren’t doing anything weird to your site. Protect your online privacy. It’s always smart to use free, legal privacy protections. For most of us, trolls aren’t much more than an annoyance. But if you were lying awake at night worrying about burglars, it would make sense to get up and lock the door. These are straightforward measures that can help prevent problems. When you do encounter trolls, block and report them promptly. Don’t engage with them, and don’t try to convince them to be good people. At first, you’ll be sorely tempted. You’ll think that if you just calmly explain to them that you are not, in fact, possessed by Satan, surely they’ll see reason. I can tell you from annoying experience, it doesn’t work. Worse, it’s an invitation to the troll to live rent-free inside your head. Block them so they can’t keep spewing their nonsense at you, report them if it’s an option, and move on to more important things. If you’d like more thoughts on how to deal with trolls, you might benefit from this podcast episode, in which I compare trolls to flaming bags of poop. But courage is about more than protecting ourselves against creeps. You’ve heard it before, but it bears repeating: When you know why you’re doing what you do, you’ll have more courage, more power, and more resilience. Making a living is a perfectly good place to start. It’s where I started, and it’s still important. I have bills to pay, like anyone else does. But a life spent just paying the bills becomes a grind. Business, and especially online-based business, is built on helping people. When you know who you help, and why it matters, it will give you an energy and resilience that’s hard to describe. And, unlike so many things in life, it never gets stale. Are you going to have tough days? Maybe even serious crises of faith? Most of those outwardly ultra-confident people you see have moments, or days — or whole years — when they feel afraid and small. Being fearless is not normal, and it’s not beneficial. The handful of genuinely fearless people are usually fearless because they lack empathy. Their ability to help others is seriously compromised, because trying to help without understanding tends to do more harm than good. Nothing is better for getting through the rough days than having a crew who understands you. It might be an official mastermind group, a community of business owners, or just a few friends who get it. Assemble a Council of Allies who are in the same game you are. Lean on one another when the days get tough. Another thing I learned from McGonigal’s book is that oxytocin, the “cuddle hormone,” is also a stress hormone. When we’re afraid, we can choose to “Tend and Befriend” — seeking the comfort and company of people we care about — over the more common “Fight or Flight” response. Reaching out to your community will not only help you feel better and manage your stress, it actually creates a physiological response that benefits your heart health and keeps your stress on the “healthy” side of the equation. Why put ourselves through it? Why stand up and speak with a true voice, about something that matters, even when we know that we may have some rocky days because of it? Because, whether your life is long or short, it’s a good idea to spend it on worthwhile things. Spend your life creating meaning. Spend it helping other people. Create a satisfying life, not just an easy one. Take reasonable measures to protect yourself. Remember the rewards of service. And get your crew together to Tend and Befriend on the rocky days. Finally, realize that stress is a sign that you’re doing something you truly care about. Be more curious than afraid. How about you? What’s your best tip for finding your courage? Let us know in the comments! I talk it out. With my best friend, sister or mother. It helps me narrow down to a decision and get on board whether or not I feel courageous. I am scared most of the times of the decision I take. As they say, maybe it will be worse – when you step back you will never know. It is better to step and know it is worse than ponder if it might be worse. Great piece Sonia. Loved the Ishi story a lot. Thank you. Not to be trite, but this post may have started me on the path to changing my life. I need to get McGonigal’s book and watch her TED talk. It’s been weighing on my heart lately that I really, really, really need to reframe my response to stress of any kind. So much stress. No words. And then this article shows up in my FB feed. Thank you. I think about the life that I was living before I found my courage and doing what resonates with me – full of unhappiness and struggle. Not wanting to go back to that life is what keeps me moving forward, putting in the work, and choosing the scary (but possibly rewarding) choices! My best tip for finding my courage in regards to online business is just to keep going. I write a funky world music blog. I love doing it. I’d love to make a living from it. And yet, not enough people care about this music enough to spend time & money on my site. Regardless, I keep going because I love the music. I’m making relationships with the musicians, and other fans, so this gives me the wherewithal to keep going with it. I totally agree what Ishi has said. We all learn from our experiences. 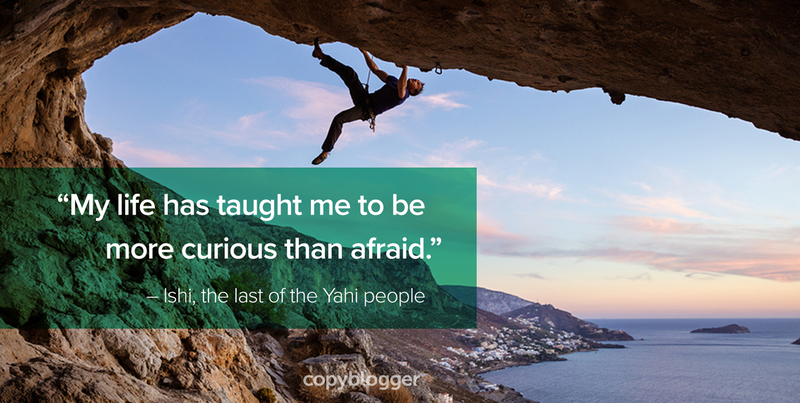 Being curious than afraid is something I would really like to adapt. And Kelly’s book seems really interesting. I always wonder about gathering the courage to do something I always wondered to do. Well, I think some more TED talks can help. Glad to read such a wonderful article. This was a really great article Sonia. We will always run into resistance and encounter trolls/haters in life. But I think the most important thing to remember is that these people represent a very small group. If we keep this in the back of our minds courage will always be with us. Hello Sonia and thank you for your suggestions. Being naturally and actively curious…though not always naturally courageous, one way I find courage is to recall the times when I am courageous. I’ve travelled many places, often beyond my native language or culture. I often get feedback, wow, you’re so brave. Travel is a natural moment where my curiosity outweighs my fear. I can use those moments to remind me in this moment when my fear might edge my curiosity out of first place. Often I give myself permission to take baby steps to move forward toward a scary goal. That might mean I start with what I call, pre-beginning—with being willing to be willing to take the first step. And that allows movement out of the frozen and into courage. An example (thx Sonia) was your post in Dec about getting a writing habit going. What you shared was not new…yet the invitation arrived in a moment when I was willing to be willing. So I wrote a tiny bit each day with no commitment to publish. And allowed the tiny bit to grow…and now I’m writing regularly. Even though I’ve now posted on my blog, the next step on the courage train…being willing to share what I write beyond my friends. Sometimes, I don’t know about you, I have brain farts…not sure what I was thinking or how to fix it once I hit “post.”. So adding a comment to my comment. The above quote is a direct quote from Pamela Wilson…not a HT. Thank you, Sonia, for creating a safe space to practice walking, “…the beautiful and rocky path.” This is when I get to pick the gravel out of my knee, dust off and take the next step forward. A little shaky, though truly excited. I like that observation about being “willing to be willing.” It can take some time to get there! Hi, Sonia! Let me start off but saying thank you for this great article. I really enjoyed it. I have had my share of ups and downs when it comes to finding and using my authentic voice with my blogging. Even after blogging for a while now I still find myself questioning how people will take the opinions or advice that I am trying to convey to them. I suppose that is at least somewhat normal as you are trying to make the majority of your readers happy, but it becomes a problem when it gets in the way of efficiently finishing an article. I have been lucky that I haven’t had any comments or emails from trolls or other negative people, but I would hope that when I eventually do get something from one of those people that I keep your suggestions in mind and try not to convince them of my opinions, thus fueling their fire. Anyways, again, thanks a lot for this great post! I think you’ll find as you make your way that you reach a point when you’re not as worried about finishing the article, and not as worried about making “most people” happy, and you start to focus on what only you can say. When you write something meaningful, something the audience couldn’t find anywhere else. That’s the scary part, it’s also the rewarding part. Such a soothing and considered article. Thank you.